When it’s all said and done, Tara Booth’s new book, NOCTURNE, published by 2dCloud, is, at its heart, a dirty joke told in long form for 64 wordless pages of painted images that almost garishly swirl with undulating blues and reds that highlight Booth’s knack for self-mockery and heartfelt exploration of both the mundane and the surreal. 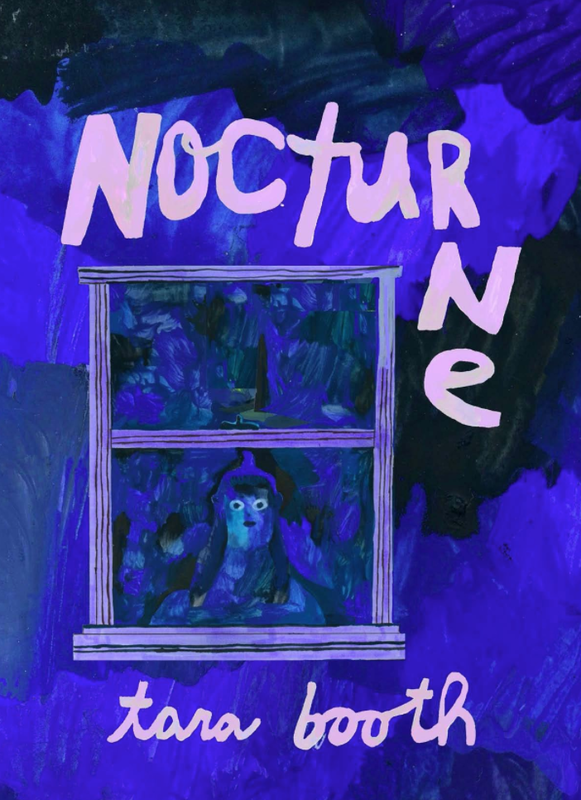 In its telling, though, Nocturne touches upon issues of consent, sexual politics, gender norms, insomnia, pharmacology, and communal living. Even with all this, though, Booth has created a book that ultimately ends on a note of acceptance, joy, and positivity. All of this is infused throughout the book. Organized in a manner that reads quickly and succinctly, even in its most hallucinatory moments, Nocturne demands a slower second read in order to parse the intricacies of Booth’s art. Her use of gouache adds a liminal element, residing as it does between watercolor and acrylics, and is perfectly suited to add to the in-between element central to Booth’s narrative. Opening with a scene exploring a clear reversal of gender norms and ideas of control, consent, and power, it shifts quickly to the visceral frustration engendered by an insomniac’s dilemma. When the central character (and Booth stand-in) attempts to deal with that frustration by turning to sleeping pills, Nocturne turns surreal and phantasmagoric, highlighting the unreality of the Western approach to medicine of ignoring the cause and treating the symptoms. Within this dream structure, the main character acts in a different reality, one that has consequences, though, within the real world and threatens the crafted social order that is basic to living within a larger group. Booth then pulls from the beginning of Nocturne in order for her character to navigate and ameliorate the new reality created out of the previous unreality, and, in this, further comments on ideas of sexual politics, consent, and norms, as well as nails the punch-line of the joke that has driven the narrative in the first place. It’s a tight ship that Tara Booth is sailing with Nocturne -- complicated, profound, easily digestible, and fun. Nocturne also shows Booth’s growth as a cartoonist, especially when placed beside her 2017 release from Retrofit/Big Planet, How To Be Alive. As such, Nocturne should easily show up on a number of “Best Books of 2018” lists and should stand as the marker of when Tara Booth went from a great artist to a spectacular one.